Are you looking for a furnished apartment on the canals in the city center of Amsterdam? 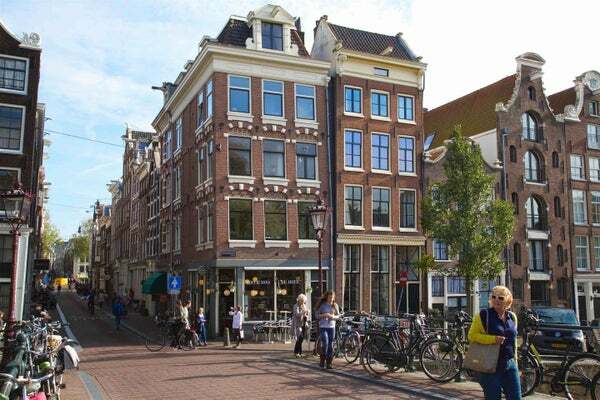 This apartment at the Prinsengracht will be available from the 1st of November. There are 2 bedrooms and 2 bathrooms. The surface of this amazing fully furnished 1.5 bedroom apartment is approximately 90 m2, and is ready to accommodate you in comfort. The icing on the cake is a big 25 m2 sun terrace where you can BBQ in summer. The fully renovated apartment looks great with the fishbone parquet floors, and the high beamed ceiling. The +/- 120 m2 apartment is situated in a listed building and is fully furnished in a modern and luxury style. It is peaceful and quite, due to the wall, ceiling & floor insulation and double-glazing. The whole apartment is 2 years ago renovated has oak parquet floors and is due to the high windows very light. The apartment contains: A 5 meter high living area with an antique chimney and has a view on the canal. It has an office area a dining area and a modern and fully equipped kitchen, a separate toilet, a master bedroom with 4 meter closets and a master bathroom with separate shower & free standing bathtub and a large washbasin. There is also a large second bedroom with a small bathroom with a shower and a washbasin. In the basement there is a small space where the washing and drying machine stand and where one could put a drying reck.